Presentation and discussion with Magdalena Dziaczkowska (Brama Grodzka). 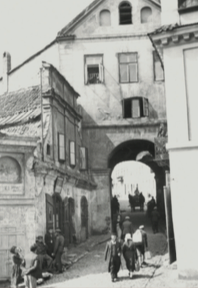 Lublin’s Brama Grodzka (literally: Town’s Gate), also known as the Jewish Gate, is among the oldest gates of the Old Town in Lublin. When a group of young Polish actors moved into this rather derelict building and proceeded to renovate it, they had very little knowledge of the building’s history. Thus, they did not know that the huge empty space they overlooked, a huge parking area, was once built up with the houses, synagogues and streets of the Jewish quarter, which the Germans had razed to the ground before they left Lublin, destroying the material legacy and memory of the Jews who had lived there. Understanding the signi cance of this absence, the young actors – who had never encountered Jews – decided to convert their theatre workshop into a unique museum dedicated to the memory of their lost Jewish neighbours. Today, Brama Grodzka is home to a remarkable initiative bringing a shared past to life through education in schools, trips for visitors, commemorative events, and exhibitions. Its manifold activities re ect on the history of the Jews of Lublin as part of their own history.